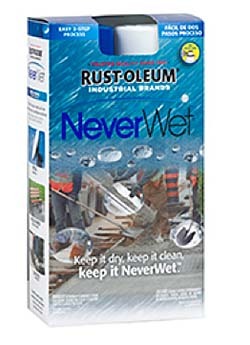 NeverWet protects surfaces with a superhydrophobic treatment that repels water, mud, and ice. The class of coatings causes liquids to form nearly perfect spheres, which shoot off the surface and keep items clean and dry. The treatment causes water droplets to form a contact angle of up to 165 degrees, more than three times the contact angle of an untreated surface. The treatment applies clear and dries to a flat, light haze and may leave slightly chalky feel. It can be exposed to water in as little as 30 minutes after the final application of top coat and is fully cured in 12 hours.